You and me? Let's rethink the way we see borderline personality disorder. Together we can fund research and raise awareness about a disorder that afflicts more people than schizophrenia and bipolar disorder combined. We can do so much more for those who continue to suffer alone, misdiagnosed, undiagnosed or untreated. I know what it's like to be that person. It took me 27 years to finally understand the root of my suffering. I began to rethink what it means to live with a mental illness. I began to rethink what it means to be diagnosed with BPD. It brought me to evidence-based treatment. It brought me to a new life where I understood that by virtue of diagnosis — whether we know it or not — we become a part of this community. Whether you belong to the community of researchers, clinicians, family and friends or live with the diagnosis itself, we must realize our potential to become enlightened leaders. We have the opportunity to challenge both the bold and subtle biases, prevailing stigma and misunderstandings. We have the opportunity to bring our disorder out of the fringes and into the center of discussion. We have the opportunity to find solidarity in each other and not be ashamed of who we are and what we are diagnosed with. We become the very hope we are looking for. Our voice matters now more than ever before. Our actions will reverberate and echo in the face of adversity. There are very few opportunities to create sustaining impact and drive change in the world. We must become leaders of this new movement, this shift, this incredible ground-swelling of progress here, within the BPD community. In fact, we can share a voice, a vision, a future of hope, honesty and understanding. I know it seems like a daunting task, but with increased awareness and our ability to back research, it is possible for us as a community to rethink borderline personality disorder. Through the Brain and Behavior Research Foundation, we can funnel funds directly to research on BPD. We can make a lasting impact on the trajectory of our disorder by donating today, by participating in this great community filled with people living with BPD, family, friends, clinicians and researchers. Together we can help others, one step at a time. Join Me on the Half Marathon Run! The RethinkBPD Team will be running the Brooklyn Half Marathon to raise funding for BBRF on May 21, 2016. While we'll be training and spreading the news, we'll also be collecting interviews of people living with BPD, family and friends, clinicians and researchers in May, Borderline Personality Disorder Month. 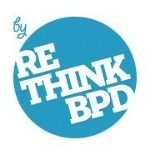 Every week there will be a few podcasts with someone special discussing how we can rethink BPD. Amanda Wang was diagnosed with borderline personality disorder in 2007 and since then has been comitted to increasing awareness and understanding about the diagnosis she shares with millions of others. Amands has been featured in Scientific American Mind and has spoken to clinicians, researchers and those living with the disorder through the National Education Alliance for Borderline Personality Disorder, National Alliance for Mental Illness, and the National Institute of Mental Health. You can watch a video of her talk at the NIMH below, where she spoke along side Dr. Marsha Linehan.